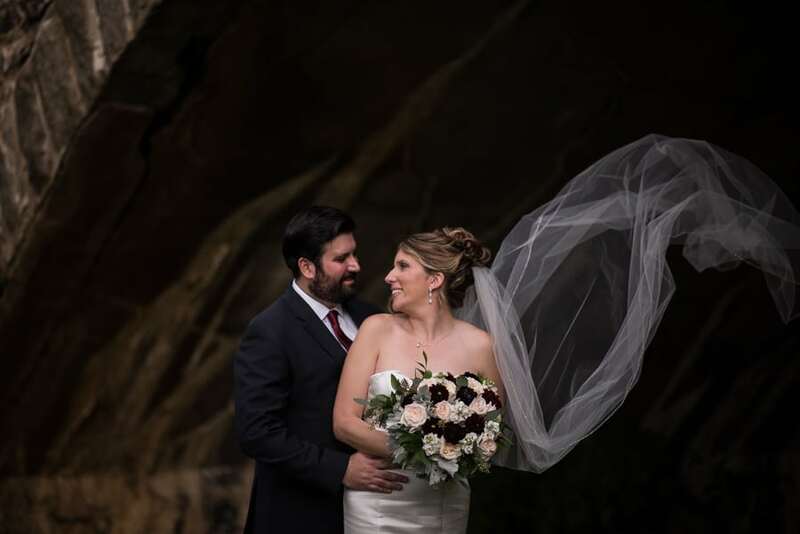 Ashley and Scott’s Brandywine Picnic Park wedding was the perfect combination of elegance and simplicity. We started at Hotel Warner where Ashley and the girls were getting ready. Avante West Chester had already given the ladies perfect hair and makeup and they were all relaxing when we arrived. We hung Ashley’s gorgeous mermaid-style Robert Bullock gown in the window and got to work. I really loved the simplicity of this dress; it was all white satin with a beaded belt to add just enough zest. The Kate Spade shoes with bows at the back were a perfect addition. 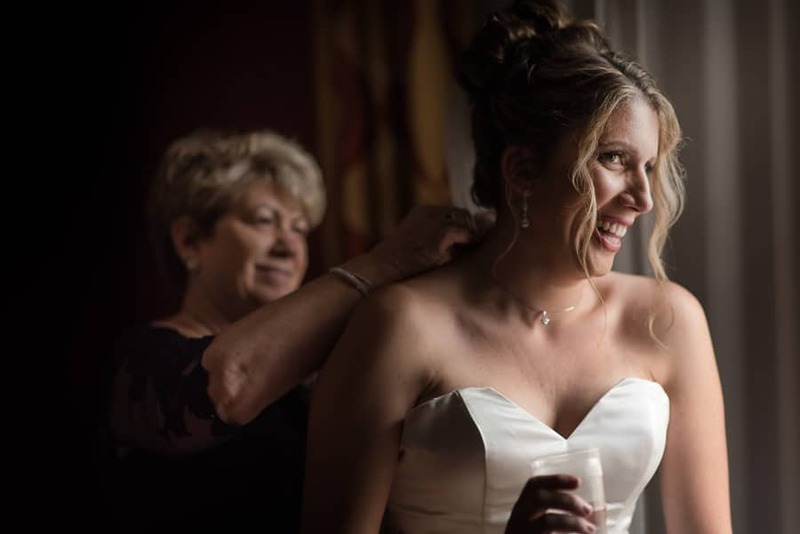 Once Ashley’s mom and bridesmaids were dressed, it was time for her to slip into the gown. It fit her perfectly and she was glowing in it. After her mom and sister helped her with her jewelry, shoes and veil, we asked everyone to step out of the room so we could have a moment alone with Ashley for portraits. We grabbed the beautiful bouquet from Blue Moon Florist which was filled with roses and dahlias and got started. 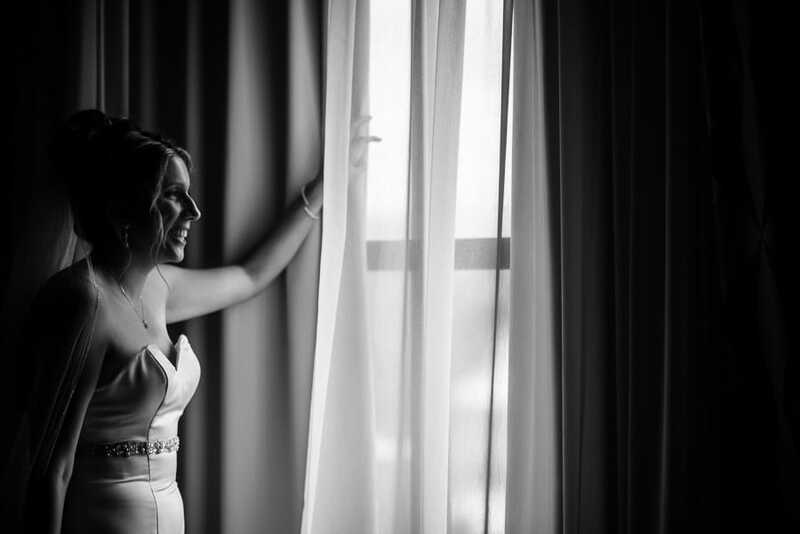 The light coming through the sheers was so beautiful and so was Ashley. We then head over to St. Agnes Parish to meet Scott and his groomsmen. We took a few moments to stare in awe at this exquisite church before grabbing a few portraits of Scott. Guests started arriving so we got set up for the ceremony. 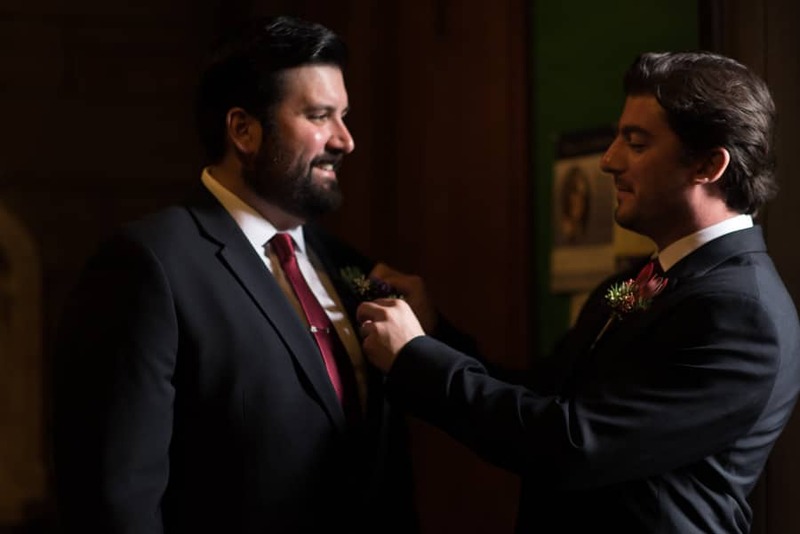 The bridesmaids wore champagne colored gowns and the groomsmen wore navy suits with maroon ties. Ashley’s niece was flower girl and she pulled the cutest little ring bearer down the aisle in a wagon engraved with the couples names and wedding date. 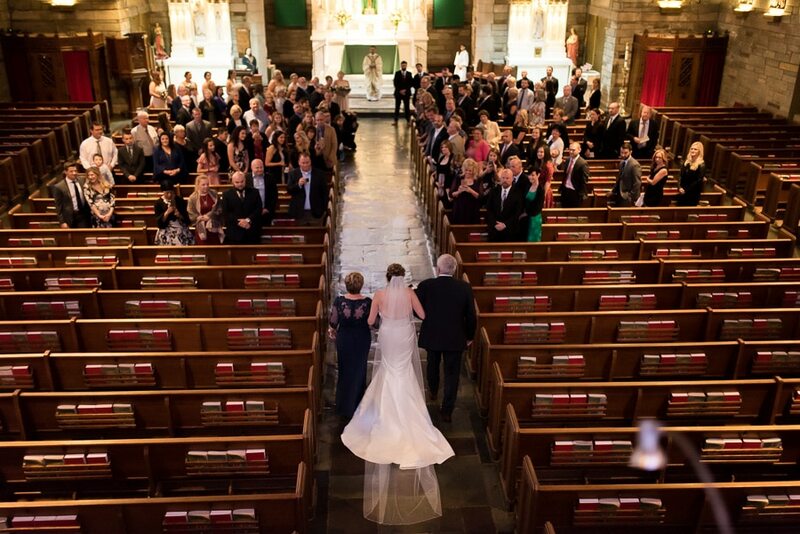 Reverend Michael G. Mullen married the couple in front of their family and friends during a traditional Catholic ceremony. Afterwards we got a quick shot of all the guests cheering for the newlyweds outside the church and family formals were taken in front of the striking alter before heading to our next stop. We arrived at Brandywine Picnic Park which is nestled amidst the rolling hills of Southern Chester County and sits along the scenic Brandywine Creek. 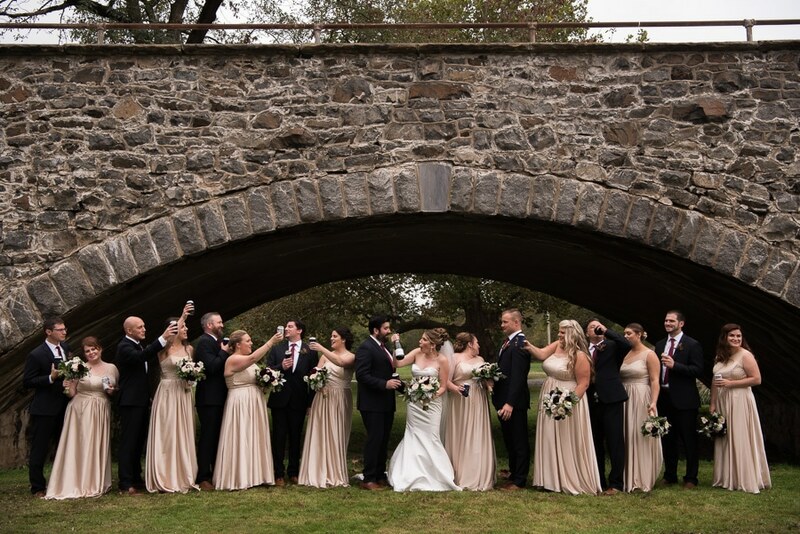 We gathered the wedding party for photos under Lenape Bridge, a gorgeous stone arch bridge built in 1912. We then took some time with the bride and groom before heading to cocktail hour in the pavilion, which was decorated with festive white pumpkins, lantern candles and lush green ferns. Guests enjoyed cocktails and hors d’oeuvres by Hickory House Catering at Brandywine Picnic Park. Some guests explored the picnic park, checking out the miniature golf course, riders, and the petting zoo including llamas, chickens and goats. There was even a talkative bird named Francis! Next everyone head over to a beautifully lit tent for dinner. DJ Nick Digiulio of White label DJ’s introduced the parents, bridal party and then the bride and groom. Ashley and Scott shared their first dance on the checkered dance floor while family and friends watched with big smiles. After the blessing came toasts by the maid of honor and best man. They both spoke of their love and admiration for the Ashley and Scott and the way the couple perfectly completes each other. After dinner Ashley danced with her dad and Scott with his mom. They then cut their cake before officially opening the dance floor for everyone to rock out. Guests loved dancing around with glow sticks and especially the ice cream sundae bar featuring ice cream from the Penn State University Creamery. 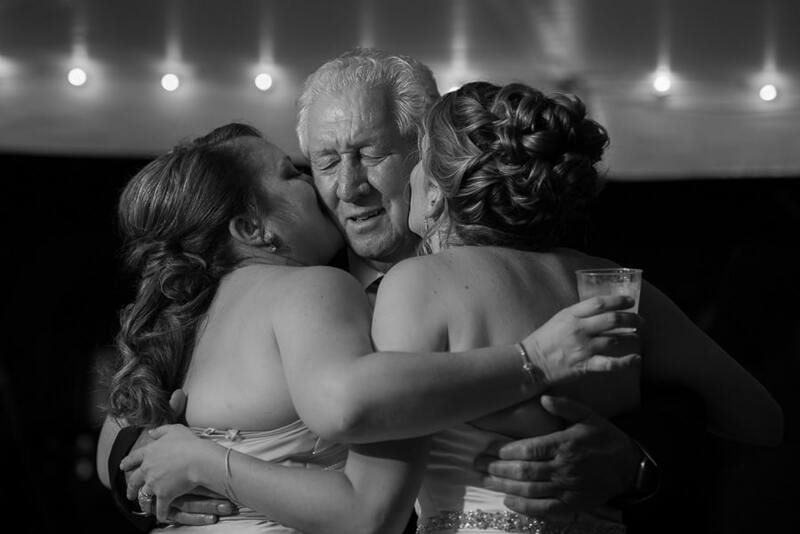 Ashley and Scott are such a sweet couple and I loved being part of their wedding day. I hope you enjoy a glimpse into their beautiful day.